At their press conference at CES last night, NVIDIA announced their newest card in the RTX family. The GeForce RTX 2060 is a more affordable RTX card and it's coming in a little over a week. 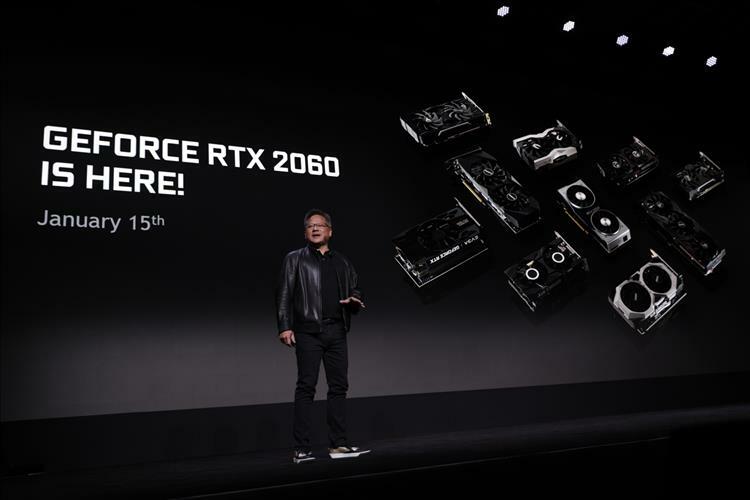 For $349 and launching on January 15th, the GeForce RTX 2060 is touted to be faster than the GeForce GTX 1070 Ti. Compared to the GeForce GTX 1060, NVIDIA says it will be 60% faster for titles out there today. Because it's in the RTX line, you'll be able to utilize the real time ray tracing feature for games like Battlefield V and Shadow of th Tomb Raider as well as DLSS anti-aliasing featured in Final Fantasy XV. Speaking of DLSS, Battlefield V will soon get an update to enable this feature in the game. For those that will be purchasing a RTX 2060, NVIDIA is going to offer your choice of Anthem or Battlefield V for free for a limited time. Planning to pick up a RTX 2080 Ti card? You'll get both games for free.